The middle school graciously allowed elementary students to take a tour in their green house and learn about the different plants they house there. 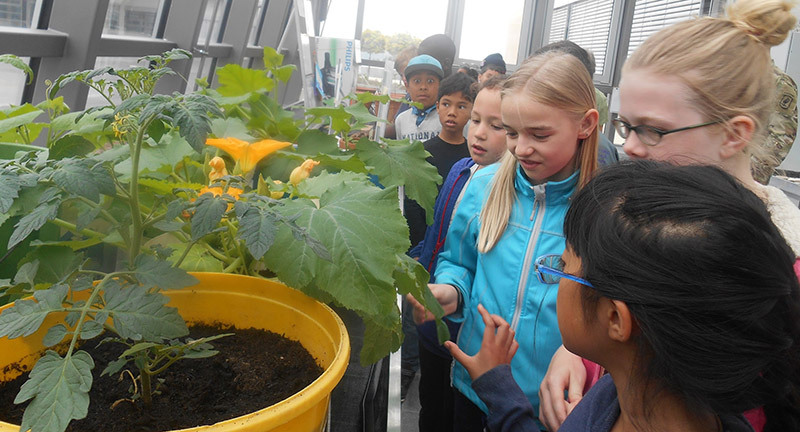 NETZABERG, Germany — On May 13 Netzaberg Elementary School students learned all about making our Earth a better place while celebrating being green with their Earth Day Extravaganza. The extravaganza featured stations where eager students learned about their Earth, a very green PowerPoint and a Volksmarch. See the photos of their adventure here. Students worked with their partner unit, 1-91 Cavalry Regiment, and those volunteer Soldiers willingly ran stations and helped the students have a great time while learning and celebrating. Hey, our military dads don’t just jump out of planes. They volunteer too. Without them students wouldn’t have had so many fun activities and stations to go to. Also, the U.S. Army Garrison Bavaria Environmental Division gave many interesting classes and shared their supplies so that students could explore and learn all about their local environment. Students learned that our wonderful world has limits on some things, but fun isn’t one of them! Students like us were very eager for this special day. The Earth deserves to be celebrated, so why shouldn’t we throw a school-wide Earth Day Extravaganza? Editor’s note: This article was reviewed, coordinated and approved for release by Ms. Margaret Ballinger, a third-grade teacher and school news liaison at Netzaberg Elementary School.